A religious organization that owns the income of a benefice (a church office endowed with fixed capital assets that provide a living for its members). 1. To give or to assign a resource to a particular person or cause: Some say that corrupt officials have been appropriating funds to spend on local projects in order to be re-elected by their constituencies or voters. 2. To take possession of something by force; such as, after a military invasion or conquest: A serious impediment to a peace settlement was the government's policy of illegally appropriating land from the farmers. 3. To identify or to set aside for a particular purpose: The city council appropriated funds for building the new library and for expanding its educational system. 4. To take possession of or to make use of something for one's own purpose, often without permission: Sara's brother is appropriating her book without her consent or knowledge. © ALL rights are reserved. 1. 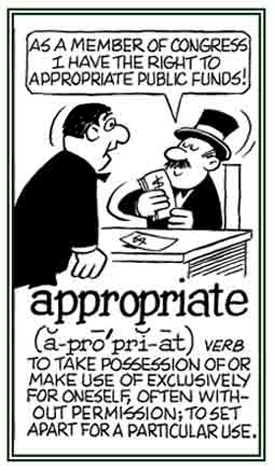 Being correct or suited for some purpose or situation: "Since this is will be a formal occasion, we will need to wear appropriate clothing." 2. A description of something that is of suitable behavior for a particular person, place, or condition, etc. : "The book is appropriate for children of all ages to read." "Many parents and city officials do not consider the movie to be an appropriate presentation for pre-teens or even teenagers." A reference to what is taken without permission or consent; especially, by public authority: "The appropriated funds that were meant for the schools were used to increase the salaries of the city-council members." Pertaining to what is proper or acceptable: "This dinner at the club is formal, so please dress appropriately." Something that is meeting certain standards of acceptability: "Many parents questioned the appropriateness of the violence in the TV program for young children." A legislative motion, or bill, that authorizes the government to spend money for specific projects or purposes. Pertaining to taking possession of something or making use of anything exclusively for oneself; often, without permission: "Leonard made an appropriative action of taking Helmi's newspaper from her desk and he never returned it." 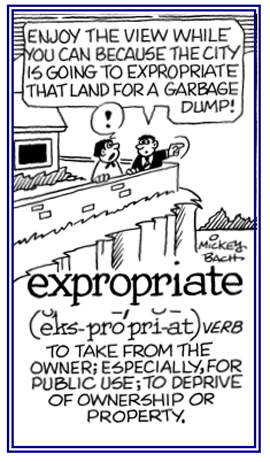 To take property or money from someone, either legally for the public good or illegally by theft or fraud: The local government had no other choice than to expropriate a strip of land from its owner in order to build a useful road for the other residents in the area. © ALL rights are reserved. Showing page 1 out of 2 pages of 24 main-word entries or main-word-entry groups.